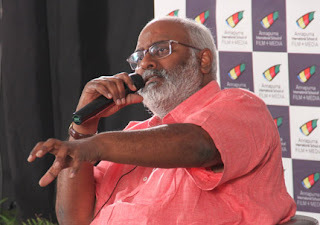 He conducted a master class to the students on Indian Film Music Composing. Keeravani is also known by his aliases Marakathamani, Vedanarayana and M. M. Kreem, who worked in the Telugu, Tamil, Kannada, Malayalam and Hindi film industries. He shared his life journey with the students. When one of the students asked him, what emotional motive he looks for when he has to assign a musical motive for a character, the legendary music director replied, “We assign a tune to a character and once we do that, the audience identifies with it.” “It’s good to experiment with different genres of music, but it entirely depends on the director and music director,” said he when asked about staying true to a genre or experimenting with music. The wide range of the courses offered at AISFM, have swiftly become a huge hit with working professionals looking to learn new skills and students honing their talents before they sign up for our degree programmes. AISFM has activities and exchange programs with leading universities from around the world, including Northwestern (USA), Chapman University (USA), Ryerson University (Canada) and Swinburne University (Australia). Our students also have the opportunity to attend the International Filmmaking Academy in Italy each year. An important part of training professionals is giving our students an opportunity to learn in a live vibrant and demanding environment, not just a theoretical classroom.